That bar room map, the daggers, chess pieces and smudged crayon crosses. My soul weeps for my city-divided, carved up and ruined. This war needs to end-no matter what. I’ll bite my tongue, cut my hair and even sleep with the enemy to restore order to New Orleans. 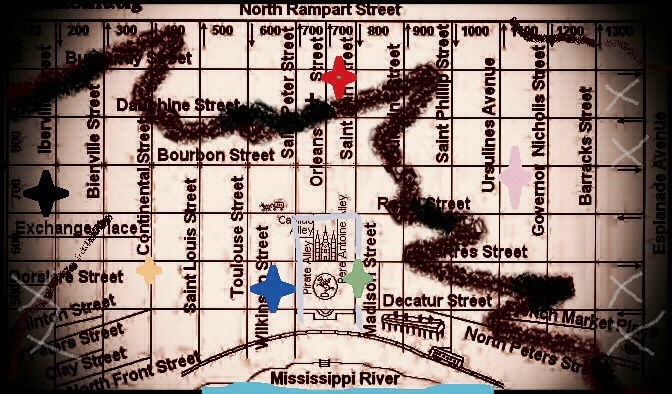 When it’s all over, bells of freedom will toll in the tower of St. Louis, isolated blocks will blend back into the Old Vieux Carre and the soul of our great city will sing with rebirth. Sparkling rockets will glisten on the river as criminals and their ceremonial weapons dissolve in the mist. But, we’re the good guys. My ten year-old daughter told me so. To my family in their days of innocence and starry eyed laughter, the gentle spirit of a Doctor who dedicated his career to those in need, the honor of my Father who defended Great Britain with his life, and my Mother who made me the woman I am today…I vow to fill you all with pride. Now, whatever I do with my fiancée on the polished star of that antique table-I’ll close the curtains first. There’s a child in the house. This entry was posted in Uncategorized and tagged French Quarter, New Orleans, Vampires.